St Christopher's Gare du Nord is a modern backpacker hostel – directly opposite Paris Gare du Nord train station. Our simple private rooms and excellent dorms are built with the modern traveller in mind. The hostel includes a big Belushi’s bar, a quirky French street café, unlimited free WiFi and unrivalled facilities. To jump the line and save time on arrival, you can even express check in online (24h the latest prior arrival) ! Travellers can also enjoy a huge basement chill out room – with a built in bar where secret events are held! Then when it’s time to explore the delights of Paris, you’ll be pleased to know that the main sights are only minutes away on the Metro - especially the Marais and Montmartre! Check in with us to enjoy all of this, the most modern Pod Beds in the city and more - at Gare du Nord. We’re just 100-metres away from the famous Gare du Nord train station, connecting London to Paris and Paris to many cities across Europe! The Metro at Gare du Nord connects you to the rest of the city and both the Marais, and Montmartre are close by! A big part of backpacking is making new friends and we aim to help out with that, whenever we can! With awesome shared dorm rooms, super relaxed chill out rooms - exclusive to backpackers and an amazing Belushi’s bar – you’ll have plenty of chance to make life long friends. We’re open 24-hours a day, 7-days a week – so you can come and go whenever you please! The price of your bed includes WiFi access, breakfast everyday and your bed linen. Add to that under-bed lockers, the privacy of 'POD' beds and the option to upgrade to a cabin room, and you’re all set! We set the benchmark pretty high when the first St Christopher’s Inn opened in Paris, in 2008. Now with a second hostel in the city, we’re taking a much-loved product from good to great! This is the next generation of backpacker hostels and we guarantee that you’re going to love every second of your time here! St Christopher's Gare Du Nord offers a wide range of private and dorm rooms. Dorm Rooms. The best of both worlds. Our dorms are fitted with our famous 'POD' beds. These next generation beds are built with the modern traveller in mind. Each has it's own privacy curtain, under-bed locker, power socket and personal reading light. Giving you the fun social atmosphere of a dorm room with the benefits of a private room. 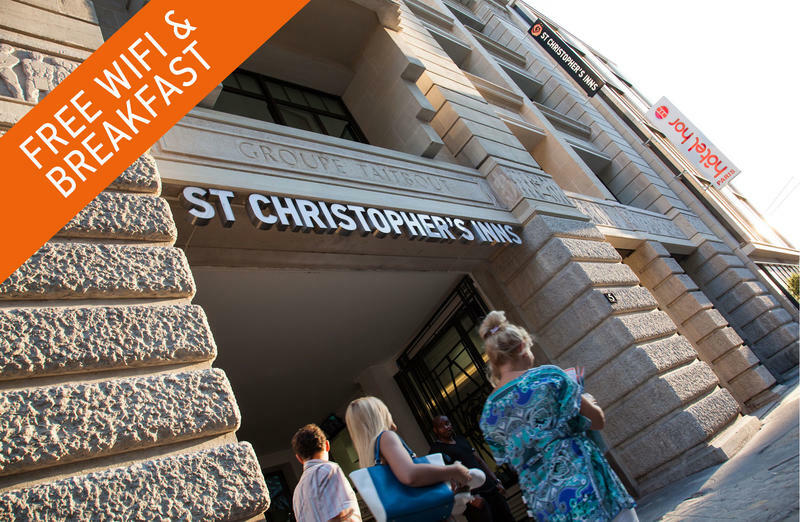 You can have the best of both world's at St Christopher's. Our dorms range from 4 to 10 bed dorms. - Plus a free continental breakfast is included in the price. Simple Private Rooms. We're no-star proud. We're all about value for money. Our no-fuss private rooms keep costs down by removing the unnecessary things. We'd rather focus on giving you a fantastic experience in Paris, a sociable bar atmosphere and a fun vibe. We're no-star proud. By cutting out the silly-little-soaps we can offer you fantastic value for money in a comfortable private room in a fun social atmosphere. From Gare du Nord (5 minutes): You will need to be on the ground level, here you will find the main entrance/exit. Once you have found the main exit you will be facing away from Gare du Nord if you turn left you should see the sign of Hotel Hor and just behind you'll see St Christopher's Inn. Walk straight for 100m to the left of Gare du Nord and you'll arrive on our doorstep. From Gare de L'est (5 minutes): Take the main exit and turn right then right, walk straight on (up the stairs) for around three minutes. You'll reach the turning for 'Rue de Dunkerque on your left. Take this turn and we're 30m along on the left. Gare St Lazare (10 minutes): Take RER E to Gare du Nord and follow the instructions above for Gare du Nord. Gare de Lyon and Gare D'austerlitz (15 and 20 minutes): Take RER D to Gare du Nord/ Metro line 5 (direction Bobigny) to Gare du Nord and follow Gare du Nord instructions. Gare Montparnasse (30 minutes): Take Metro Line 4 towards Porte de Clignancourt, get off at Gare du nord and follow instructions above. Charles de Gaulle (Terminal 1 and 2) (~€10): This journey will take 30-40 minutes. Take the RER-B towards Robinson. Get off at Gare du Nord and follow the instructions above for Gare du Nord. Orly (Sud and Ouest) (~€12): This journey will take up to 1 hour. Take the shuttle from Orly to Anthony/ Shuttle bus to Denfert Rochereau (Bothe stations on RER B). Take the RER B from here towards Aeroport CDG. Get off at Gare du Nord and follow the instructions above. Beauvais airport is 1hr 45 mins travel time away from Gare du Nord. Take the shuttle bust provided (€16) to Porte Maillot. From here take the metro Line 1 to Chatelet, change to Chatelet where you can take Line 4 direction Porte de Clignancourt or RER B towards Aeroport CDG. Get off at Gare du Nrd and follow the instructions above.